I start by using "Dear family", so that though we have meandered into more general topics, you know that I am still really addressing these messages to you. 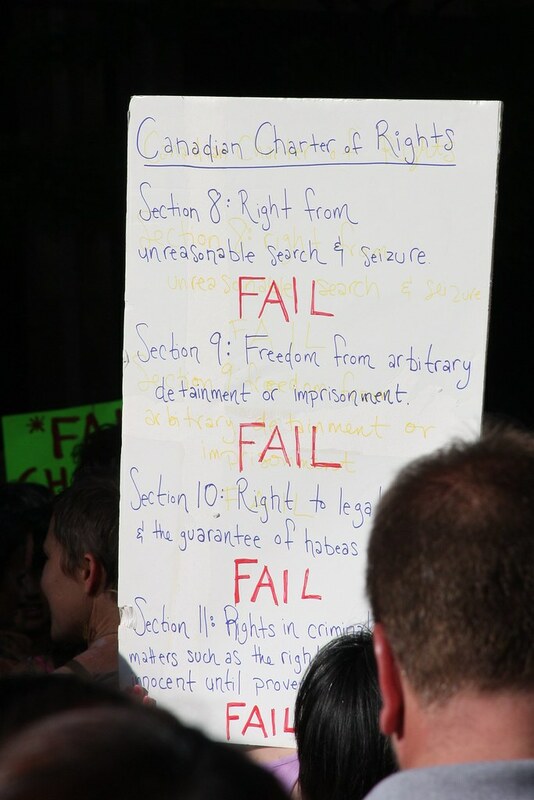 With Selena's emphatic agreement, I went down to the Jail Solidarity Rally last night. I have, of course loads of pictures, but no time to process them online. The event was a last-minute thing, and not well organized. All of the speakers shared one unidirectional megaphone. It was virtually impossible to hear their distorted voices by most of the large crowd most of the time. There were, an enormous amount of police present, even though a lot less than during the earlier protests. Yet, despite that, and despite the "big issue" (the G20) being over, the crowd did not dissipate, but more and more people joined -- clearly upset about police treatment of themselves or of others. The chants of "free our friends! ", and "shame!" were like roars into the empty sky. There were many, many stories. And many were quite shocking. For those of you who think we take an extremist view of things, I invite you to read this one particularly well written account of detainment, by a 21 year old McGill student, and think about what country we live in. It sure doesn't sound like the country we think we all know and love. It demonstrates (yet again) that when the authorities are able to be given these crazy powers at the drop of the hat, will quickly become as nasty and cruel, arbitrary and chaotic, as any police in any country we consider backwards. These are important issues, which though they seem somewhat distant to most of us in our mostly peaceful and reasonable society, are closer than we may think. For those of us on the ground listening to the chants of "this is what a police state looks like!" ... the mere reality standing in front of us was brutal. It really was frightening to consider how quickly the face of the city can change, and what a thin shell all our freedoms rest upon. Why do the protesters always have to be proved right in this manner, before everyone else slowly starts to wake up? I read, in a lot of comments around the net, ignorant (from my perspective) people deriding the protesters as freaks of various kinds. It is true there's a higher percentage of "unusual" people at these events. This is because people slightly outside the norm are the ones most likely to be sensitive to and experience the darker sides of societal oppression. These people need to be respected as bellwethers of our society, not dismissed or dehumanized. But besides the over-emphasis on this, my photos, when I get them online, fairly clearly show that actually there are a huge number of just average looking people, which seem not to really be represented in the main stream media coverage. This last weekend has been quite an experience indeed. In a strange sort of way, I almost feel like we should thank the G20 powers for granting us this little taste of martial insanity. But, as Canada returns to "normal", will we remember? At the end of the Jail Solidarity Rally, the fellow with the megaphone started chanting something like "This is not the end! This is just the beginning! ", and exhorting people to not let it end, but to get involved in community organizations ("Coalition Against Poverty" was one that was mentioned).